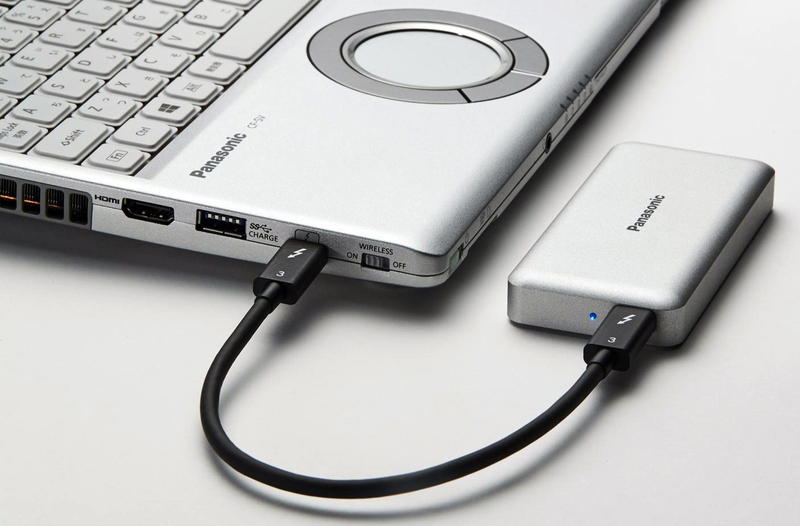 Panasonic has unveiled its first external SSDs featuring a Thunderbolt 3 interface. Panasonic’s Thunderbolt 3 Compact Lightweight Portable SSD enables the company to offer high-performance storage devices for its TB3-enabled PCs. However, it looks like the device was not originally designed by Panasonic. 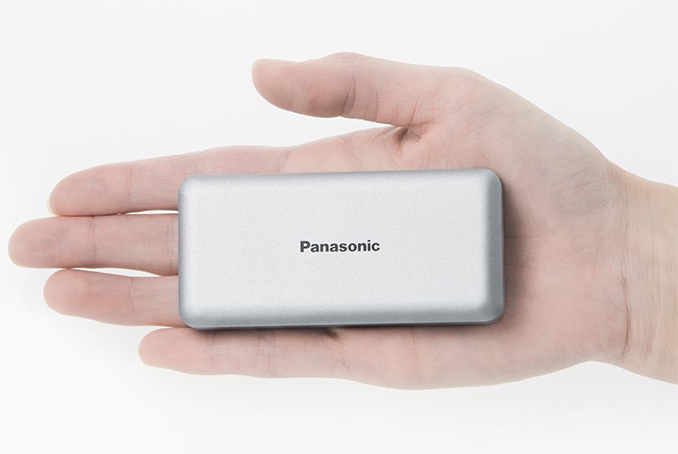 Panasonic’s Thunderbolt 3 Compact Lightweight Portable SSD will be available in 512 GB (RP-SBD 512P3) and 1 TB (RP-SBD 1TBP3) configurations, which will offer up to 1500 MB/s sequential read performance and up to 1000 MB/s sequential write performance. The device is bus-powered and does not need any external power bricks. Measuring 102×40×14.4 mm and weighing around 90 grams, the Thunderbolt 3 Portable SSD can easily fit into a pocket. 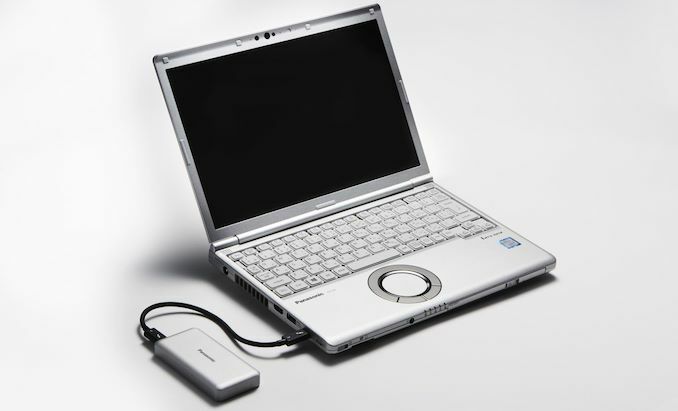 As for rigidity, the drives come in an aluminum enclosure and can handle vibrations and shock. In fact, Panasonic claims that the SSDs can handle a drop test from 76 cm. It is noteworthy that Panasonic’s Thunderbolt 3 Portable SSDs bears a striking resemblance to Patriot’s EVLVR external TB3 drives introduced earlier this year, which in turn uses a reference design developed by Phison. Considering the fact that the latter sells turnkey, already-assembled products, it is more than likely that Panasonic’s storage device was designed and built by Phison. That said, the drive packs Intel’s Alpine Ridge TB3 controller, an NVMe 1.2-compliant Phison PS5008-E8 controller with a PCIe 3.0 x2 interface as well as Toshiba's 256 Gb BiCS3 3D TLC NAND memory. Performance of such drives is well known and it is consistent with manufacturer’s claims. Panasonic’s Thunderbolt 3 Portable SSDs will come pre-formatted with the exFAT file system, so they will be compatible both with MacOS as well as Windows-based PCs. The drives will go on sale on December 19, yet their prices are unknown. Typically, Phison-powered SSDs are relatively inexpensive, but Panasonic may want to earn a premium for its brand. That is a great question! I have the same one.